Showing 21 articles from March 2, 2015. Community organizers have announced a poker ride motorcycle run for later this month to benefit a family impacted by a devastating fire in Winlock last Thursday morning. Scheduled to take place March 21, the ride will begin at St. Helens Tap House, in Toledo, and will follow a 75-mile loop to Frosty's Tavern, in Napavine, The Club Tavern and Franks Hide Away, in Winlock, Pastime Tavern, in Castle Rock, and back to St. Helens Tap House. Ryderwood's Spring Arts & Crafts Fair and Quilt Display is planned for May 15 & 16, with vendors able to sign up for limited spaces at this time. The Arts & Crafts Fair will take place in the two large rooms of Community Hall, while the Quilt Display will be held in Pioneer Hall. Due to the popularity of the Fair, the number of vendors will be limited to 35 so applications should be submitted quickly. The deadline for all applications is May 8. The cost is $20 for each 6 ft.-by-6 ft. space, table included. Interested vendors should contact Norma at (360) 295-3672 for an application. Toledo recently entered two "Life Smarts" teams and took first and third places at the state level, and are expected to compete at the national completion in Seattle held April 17-21. Pictured (left to right) are Coach Rene Ketchum and student participants Austyn Smith, Daniel Echtle, Adam Slighte, Aaron Bratina, and Alex Palermo. 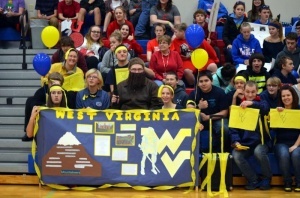 The week of February 23rd was March Madness Week at Willapa Valley High School. The first week of a new month means the nearly world famous Ryderwood Town Breakfast is coming up on Saturday. For a very fair price, you can get the finest choices of breakfast fare available anywhere. There are pancakes, biscuits and gravy, eggs any style, ham OR sausage, orange juice and bottomless coffee. Serving times are from 8 to 10 a.m. Meanwhile, Friday night's dinner at the Café will feature Nancy's Chicken Enchiladas. As usual, a Beverage, Salad and Dessert are always included for $9. Reservations are required and need to be made by 6 p.m. Wednesday - Call Linda at (360) 295-0875. Billie Washington says: Native Soil Farm is a Natural Agriculture farm cultivating wholesome food from heirloom or indigenous seeds without fertilizers, chemicals or additives. It is living in harmony with Nature - pure soil, pure seed, pure mind - offering fresh locally grown food with vital energy. The Farm Stand opens this Spring, date TBA. Come meet your farmer. Park Board Chair Steven Krohn says a request from the Country Cruisers Car Club has been approved to hold their annual car show at McMurphy Park later this year. Specific dates are to be announced, so keep reading for more info. A First Aid/CPR class at City Hall has been rescheduled to March 28 from 9 a.m. to 1 p.m. The cost remains $50 per person, with registration required beforehand. Those with questions may call City Hall at (360) 295-3222. Winlock was rocked by a horrific tragedy this week. A woman and two children perished in a house fire that leveled the family home. Winlock has once again shown its true colors by supporting the family. There is a fund set up at Umpqua Bank that will assist the family as they deal with this loss. If you would like to donate, please drop by the bank. I also understand that the manager at Aaron's in Chehalis is a Winlock resident and is also taking clothing donations. Please help this family as they take on the task of rebuilding their lives. We would like to offer our condolences to the family as they go through this difficult time. Please keep the family in your thoughts and prayers. A few people have called wanting to know the location of Rock Crusher Hill. With the coverage we have given on the troubled spot on Highway 101, between Cosmopolis and Raymond, not everyone is familiar with the local tag of Rock Crusher Hill. After 30 years in business, we have sold Washington Physical Therapy on 2/9/15. We have truly enjoyed the community and treasure the experience with the kind people of Pacific County. This week we spend some time and bring you a small basketball portfolio of local photographer Larry Bale. The Castle Rock City Council has approved a contractor to begin work on their new Visitor's Center at Exit 49, with the building expected to be completed possibly by September. Approved during the council's Feb. 23 meeting, Battle Ground-based Wolf Industries Inc. was awarded the bid for the project, which is estimated to cost around $97,000 and will bring the project to a "weathered in" state by the middle of August, after which time other contractors and volunteers will complete utilities and other finishing work. Members of the Vader City Council have stuck to their guns when responding to criticisms against a potential ban barring marijuana businesses during follow-up to a related hearing at their most recent meeting. When discussing the Feb. 12 hearing during their Feb. 26 meeting, council members stated, after considering what members of the public had to say regarding the matter, they remain unconvinced that marijuana production, processing and retail facilities would pose no harm to their community, and produced copies of specific articles upholding their perspective. The Winlock City Council has taken their first step in the process of studying the city's water and sewer rates, with a list of recommendations expected by sometime around May. Though a study of the city's sewer rates has been under way since last fall, the council had their first in-depth exposure to the details and intent of the study during a workshop held before their regular meeting Feb. 23. Baseball registrations were dropped off at Raymond, South Bend and Valley schools for those interested in baseball signups for ages 5-18. Don't tell Castle Rock Head Coach Kevin Johnson that his boys are upsetting teams as they advance in the WIAA 1A State Basketball Tournament, like they did Saturday afternoon with a 66-58 win over Overlake School of Redmond at W.F. West High School. The victory puts Castle Rock into the field of eight teams that will begin the final drive toward the gold ball on Thursday in the Yakima Sun Dome. The little guys were just not quick enough to counteract the tall, lanky team from Walla Walla Academy as the Knights ended Toledo's season with a 50 to 45 loss in the WIAA State Tournament Regionals Saturday night in Tumwater. Brent Wood led the Indians with 17 points including some hot early shooting, but the Indians could not sustain the sizzling hand shooting to pull the Knights from their very effective zone defense. Authorities are seeking help solving a burglary near Morton last month. Between Feb. 23 and 26, suspect(s) entered an unlocked shop building on the 1700 block of SR 7, north of Morton, and stole two Sthil chainsaws, a tool box and a remote-controlled helicopter. The estimated loss is $600. A majority of fire districts receiving services from Lewis County Medic One have reached consensus on how to restructure the agency's revenue policies, though official approval of such a plan is still pending. Discussed during a workshop held Feb. 25, representatives from Lewis County Fire Districts 1, in Onalaska, 3, in Mossyrock, 8, in Salkum, 15, in Winlock, and 2, in Toledo, met to find common ground regarding plans to overcome a potential revenue deficit of $265,000 expected this year, according to current estimates, while keeping the priorities of their commissioners and taxpayers in mind. Local fire and EMS calls between Feb. 23 and March 1. Organizers with Centralia's historic Fox Theater have reported their first sellout crowd in seven years after Saturday's screening of Indiana Jones and the Raiders of the Lost Ark kicked off their 2015 film series. Scott White, president of the non-profit group who have been restoring the building since 2008, said the support of sponsors and word of mouth has been drawing ever-increasing crowds over the last few years, resulting in a packed house--and then some--on Saturday evening.